Hannah Genders plans the creation of a decorative vegetable garden. As many of you will know, I have in the last year taken on a new garden, and there is one area that I ‘ve been looking at and trying to decide what to do with it. To the back and side of the house is an enclosed, walled garden – the wall was built of reclaimed bricks by the previous owner and so has some painted blue bricks in with the terracotta ones. It’s a very attractive feature and the garden wall faces directly south and east although the house is north facing on this side. A door out on to the garden is very near the kitchen and so I have come up with the idea of creating a potager out here. Potager comes from the French phrase potager jardin and refers to the decorative vegetable gardens seen in the grand chateaux of France. The style is ornate with small paths, clipped box hedging and a mixture of vegetables, herbs and flowers in the borders. Although in the gardens of France it was always done on a very grand scale, the style lends itself to smaller gardens and has the advantage of looking good through the winter months due to a strong design and structural planting. The layout is usually geometric and the planting is close together in rows or blocks. My walled garden has some definite advantages for creating a potager – it is near the house and therefore easy for me to pop out and pick produce; and the wall is south facing so about half the space gets plenty of sunshine through the day and into the evening. The area near the house is north facing and so needs to be filled with perennials that will cope with shade, but this can still be designed in and attractive. In preparation for getting the work done, I have done some sketches to see how the ideas would work in this space. I have placed a central patio to allow for sitting and eating out right in the middle of the vegetable and herb beds. I will design a screen to go on either side of this space in local cleft wood to give it some character, and grow fruit trees on it. I have two trees at the top of the garden that have already been trained as espaliers – one pear, one apple – so I’ll move these in the winter months. An ideal time to move trees is November to February when the tree is dormant. These trees are quite large so I will probably need a mini digger to do this, and will try and move as much soil as possible with the roots and then water them in really well. Over the patio area I will construct a structure to hold a fig or vine and give the sense of enclosure underneath where the table is situated. The main patio will be reclaimed stone and brick, the other paths will be gravel to keep costs down, and the paths need to have a weed-free membrane underneath to cut down on the weeding. The borders can either be edged in brick to match the patio, or wooden boards. Each of the main beds will then be planted with a low, clipped box hedge and large pots can be used as focal points in the borders to give cohesion to the whole space. In measuring out the space I realised none of the walls are square in this old house, but this doesn’t matter; if you line up the central beds and make them square then the area will look right even though the planted areas move in and out a bit. While I’m doing the hard landscaping I will add in some electric lighting, subtle enough to light the space and enjoy sitting out on a summer’s evening. It’s also important to have permanent seating in and around this sort of garden to be able to sit and enjoy it, or rest in between picking the beans and flowers. Speaking of flowers, I do want this area to be attractive as it’s so near to the house, so I will be planting it with lots of flowers to enjoy and also to pick for the house. 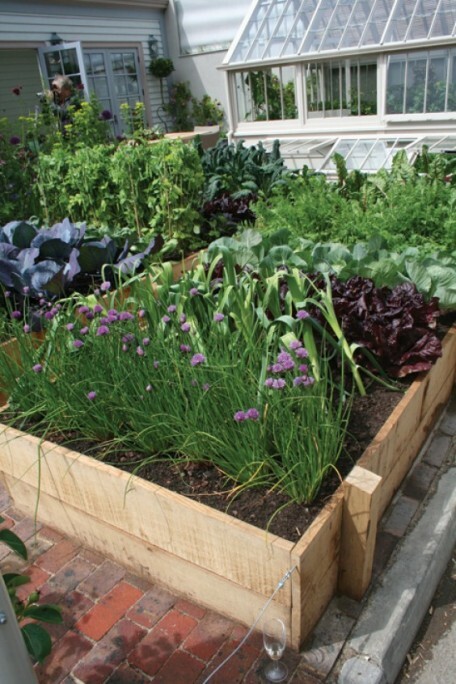 The herb beds need to be in the sunniest areas and can, along with the flowers, have the added attraction of enticing bees and other beneficial insects into the garden. With winter coming on, it is the ideal time to get the hard landscaping done on a project like this one – and then I will be ready to plant out and enjoy the space next spring. If you like the thought of a potager or new vegetable plot in your own garden, do give me a ring for design ideas and advice.